Departure of Tour : Marrakech. Duration of Tour : 2 Days 1 Night. End of Tour : Marrakech. Day 1 : Marakech – Ait Benhaddou – Ouarzazate – Draa Valley – Zagora. 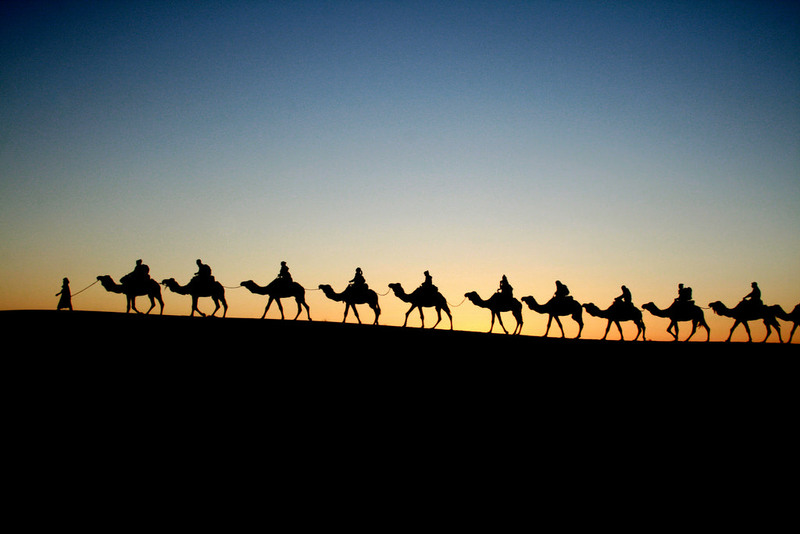 The departure of the 2 days desert trip to Zagora will be in the morning, wether from the Airport or your Hotel. After that we drive through the high Atlas Mountains at the summit of 2260m (Tizi n Tichka). It means (difficult pass). We will stop for pictures through the views and Ait Benhadou’kasbah. It is classed by the UNESCO, as World Heritage Site since 1987. 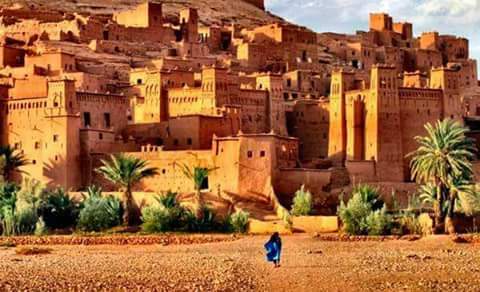 Lunch will be in the Hollywood of North Africa named Ouarzazate city, which is departure of Sahara desert. We continue through ”Draa valley” at the length of 200 kms. And then arrived Zagora. 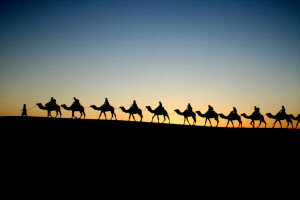 Then, You will ride camels for a 1 hour trekking out into the desert dunes to watch the magical sunset. You will spend the night in Berber nomad tent with local delicious dinner . Day 2 : Zagora – Agdez – High Atlas Mountains – Marrakech. You can wake up early to enjoy the sunrise over the dunes and fantastic landscapes of harsh sahara desert land. After those beautiful moments and exploration experience of desert land you will have your breakfast meal in camp, the sun shining and becomes warm or little hot you ride your camels back to Zagora Hotel. We also can drive our 4×4 car just from the camp instead of riding the camels to the road. We drive back to Marrakech through the Draa valley and Agdez to discover the hidden treasures of the Southern regions. Continue to Ouarzazate city where you will have your lunch and explore the city with its ‘Cinema Studios’. In the fternoon drive back to Marrakech via the high Atlas Mountains. We reach Marrakech around 06:00 p.m and the end of the 2 days. – Experienced driver guide (English speaking). – Pick up and drop off from and in your accommodation. – Kasbah Ait Ben Haddou visit with guide. – Private tent in Zagora desert camp. – Water for camel trip. – Berber scarf each (Turban). NOTE : If the itinerary of the 2 Days tour we provide does not match what you’re looking for, please Email us, and we will prepare the trip to match your needs and requirements.